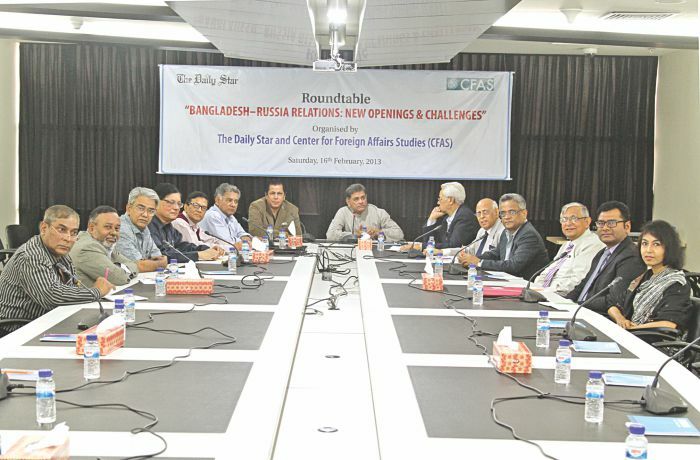 CFAS and The Daily Star organised a roundtable on " Bangladesh-Russia relations : New openings & challenges" on February16, 2013. We publish a summary of the discussions. I would implore all of you to help us become a more authentic voice in foreign policy. We should do this for our national interest. In one stroke, we have a nuclear power plant deal; we have a billion dollar arms deal. We know that arms deal is not a one-off affair. It links to all sorts of follow up measures. We need to scrutinize and speak on the arms deal aspect. And the huge cost of it is $1 billion at 4.5 % interest. How do we fund it? I really do not subscribe to the view that a country that had been friendly to us during the liberation has to be compensated by some other means. That is an issue of national interest. Our national interests are suffering by our failure to give foreign policy the importance it deserves in our governance. The general perception is that Bangladesh's military purchases are being made from China. Suddenly, the prime minister has shifted to Russia. Nobody was prepared for that. She made a deal, which was of $ 1 billion. The most dangerous part of it is the nuclear part. There are nuclear technologies for civilian uses coming from various countries in the world. France is one of them. But compared to France the general perception about Russia in this sector is not a very good one. We know about Chernobyl. When talking about a nuclear plant, Bangladesh is a heavily populated country that enhances the risks of opting for nuclear power. The other issue is the $ 1 billion arms deal and the interest rate of 4.5%. These issues have not been discussed in parliament or in any seminar or in any forum at all. Any bilateral relations have different dimensions. Whether we like it or not, history and geography inevitably tend to shape our relations with any country. In that context, if we look at our relations with Russia we will observe how hitherto "super adversary" Russia of Pakistan time had emerged as a "Super friend" of Bangladesh during initial years of our nationhood. Our relations with Russia have been long, complicated and it went through various ups and downs. Let us start with the partition of India. The then Soviet Union initially, did not favor partition of India, as they were not sure what kind of entities would emerge in the region. Newly independent Pakistan rebuffed by Britain and Commonwealth on the question of Kashmir, showed some interest to develop relations with Russia to enlist latter's support in her ongoing tussle with India. Russia had invited the first Prime Minister of Pakistan Liaquat Ali Khan to visit Moscow but Islamabad was not sure whether Moscow would be able or willing to extend that kind of moral and material support to her to meet India. Hence, Liaquat instead of visiting Moscow went to Washington and that marked the beginning of pro-American tilt in Pakistan's foreign policy. Subsequently, after the promulgation of martial law, Pakistan formally joined two Western military alliances namely SEATO and CENTO. On the other hand, Nehru played his cards very well. Instead of joining these military alliances, he joined the NAM and maintained balanced relations with both Washington and Moscow. After the U2 incident, Pakistan's relations with Russia reached the lowest ebb and India emerged as a darling of Russia. After Indo-Pakistan war of 1965, Soviet Union played a very important mediatory role and the peace agreement between the two archrivals, India and Pakistan was signed in Tashkent. This normalization process between Islamabad and Moscow continued until Pakistan started military operations and our liberation war started in March 1971. In early April 1971, Soviet President Podgorny was the first Head of State to express concern at genocide and atrocities committed by Pakistani soldiers in Bangladesh and he had called for political resolution of the issue. During our liberation war, Moscow extended her full support to our cause in the international arena. When the Indo-Pak war broke out in December 1971, they vetoed thrice to block western draft resolutions, which had called for cease fire without referring to the need for political resolution of the issue. On ground, Russia stationed huge troops on her borders with China to discourage the latter from militarily intervention in the Bangladesh war. When President Nixon decided to send their seventh fleet to the Bay of Bengal ostensibly to rescue their war-stranded expatriates, Moscow quickly sent her fleet to the same area. In 1972, a totally war devastated Bangladesh needed huge international assistance to reconstruct her economy, emergency food assistance to feed the millions and to rehabilitate millions of refugees. When assistance from other sources was not forthcoming, they responded to our request and sent their naval personnel to clear mines (planted by Pakistani forces) and to reactivate our sole port in Chittagong. Likewise, they helped us build various thermal power plants; met our initial defense needs, various logistic supports to dispatch emergency assistance, and offered large number of scholarships to our students to study in various Soviet universities. Under a barter trade arrangement, they imported our primary products like jute, tea, leather etc. and in return, exported to us various industrial goods and minerals. After murder of Bangabandhu in August '75, the autocratic military regimes that came to power abruptly suspended our ongoing bilateral cooperation relations with Moscow with a view to gaining recognition of their regimes by the western powers in the then cold war era. The bilateral relations reached the lowest ebb when Bangladesh had expelled large number of Russian diplomats from Dhaka. After restoration of democracy in Bangladesh in 1991 some overtures were made to restore our relations with new Russia with limited success. When the present government came to power in 2009, Prime Minister Sheikh Hasina visited St. Petersburg to attend an international meeting for the preservation of tiger. She took advantage of the visit to meet President Putin and other Russian leaders with a view to establishing a platform for resumption of bilateral cooperation. As a follow up of these talks, Prime Minister Hasina visited Moscow in January 2013 and signed three important agreements, first revival and expansion of a nuclear power plant in Rooppur with the capacity to generate 2000 (instead of earlier 200) MW of power. Bangladesh has very limited options to meet its growing energy needs. We therefore have to look at nuclear power as a viable alternative. Secondly, the Russians have also agreed to help us in the exploration of gas in the main land. During the visit, Bangladesh also signed a billion dollars arms purchase deal with the Russians. Three reasons have been given for purchasing the arms, which are basically defensive in nature, firstly, to meet our bare minimum deterrent needs, secondly, to meet the needs our troops stationed under various UN Peacekeeping Operations. The government hopes to meet the lion's share of the cost of these arms through rental reimbursements from the UN. Thirdly, these arms are needed by our navy to protect our huge maritime areas which we will be emerging after getting the verdicts by the International Tribunal of the Law of the Seas (ITLOS). A question has arisen as to why the Government is buying these arms from Russia instead of China? Russia was the primary supplier of our arms prior to August 1975. Chinese arms that we have been importing are basically designed on Russian models and China still remains one of the largest buyers of Russian arms. It is very much necessary to diversify our arms supply source to meet all eventualities. Likewise, we must diversify our export market as virtually overwhelming part of our exports go to the USA and EU, Russia offers a huge market for our garments and other exportable. In the Liberation War, we used mostly Chinese arms as western supply line was almost squeezed in Pakistan after 1965. We got our first weapon MI 8 as donation in the air force. Our air force got continuous support from Soviet Union. Our helicopters are mainly Russian made. China also purchases helicopters from Russia. MI series is so reliable that most western countries are also using MI 8 mainly in mining and oil and gas producing sectors. Therefore, it is clear that our air force has developed a supply line and maintenance system with Russia. The development of armed forces in Bangladesh was haphazard. It had no plan as such. And for supply of equipments we found China was the best supplier. Particularly at the time of Ziaur Rahman, China gradually became a part of our foreign policy. We had Chinese help to start Bangladesh Ordnance Factory. Today Bangladesh Ordnance Factory produces all kinds of small arms. Every country has a defense policy. Bangladesh armed forces neither have experts to formulate it nor have they asked for expert support from abroad to develop the armed forces. When I talk about defense policy I am talking about the political side. It is not that the army, air force or navy is functioning according to their own will. There are policies. But I am talking about higher direction and higher defense organisation. Since we have no policy, we do not have any purchase policy also. Your defense mechanism should be explained in your policy and all these correlate to your built-in weapon policy and other policies as well. If we had a defense policy then we would also have a cabinet defense committee for defense. Now the question is, why from Russia? Actually, this deal has been talked about over a year. Are we purchasing the weapons of our choice or not? If we wanted to buy a squadron of T 90 tanks would we get it from Russia? No way. Russia will not sell T 90 to Bangladesh. T 90 has been sold only to India. If we talk about the Indian purchase from Russia, those purchases and our purchase are not comparable at all. India is buying very high tech and sophisticated Russian equipments. The Russian equipment market has been squeezed. India is no more dependent wholly on Russia. India has been buying mostly the US origin equipments from Israel. The Russian market in North Africa has been squeezed. Libya is no more its market. Egypt has left Russia because of equipment concern. Syria is in trouble and Iraq is no more a buyer. And Central and West Africans are in the grip of the Western powers. So, Russians are looking for a market and one of them is Bangladesh, no matter how small it is. Strategically, Russia has started looking east. The Middle East is almost going out of their hand. Our Bangladesh army is not small -- it is the third largest armed forces in the subcontinent. We need a policy. Under the civilian authority, through a policy it should be run properly. Russia wants to show they are a Pacific power. Their trade in Asia is only 2 %. So they want to increase their trade whether it is armament or merchandise. They have reformulated their foreign policy in that direction. When they realized that, sixty percent of the naval asset of the American will be now in Asia Pacific. Russia has a common union with Kazakhstan and Belarus. So if we can enter Russia we can enter the market of the three countries. But most important is that this government until four years could not make a bilateral visit to the US. US Secretary of State Hillary Clinton came for a few hours and signed a joint declaration on dialogue. It is wrong to suggest that we should choose between the US and Russia. We can manage both. But their lies our foreign policy. Foreign policy does not mean only foreign relations. Foreign policy covers the whole gamut of issues: migration, trade, environment, food everything. Russia was offended after 1975; we expelled 75 Russian diplomats from Bangladesh saying that they were doing undiplomatic activities. Russia is not a communist country now. Bangladesh-Russia relation is a new chapter in the sense that we are trying to restore our relationship with Russia. The next point is that announcement of relations with Russia might give us a bit of diplomatic advantages in negotiating with others. But this is not tangible but influences the other parties. My point is why it was not discussed in the parliament before prime minister made a visit to Russia. Any interest over 1.5% is a hard loan. Russia will charge 4.5% for the $ 1 billion. The next point is $500 million feasibility studies. These studies should be done by an objective third party. Two teams are coming from IAEA. One will evaluate our human resource management and development issue. We need minimum 1600 fully trained officers minimum to do the job. The next team will evaluate engineering and environmental safety. Who will take the nuclear waste? Russia is preferred because they are willing to take the nuclear waste. No other countries have agreed to that extent. Experts say that the river is almost dry. Therefore, more expensive cooler has to be installed because of the absence of natural cooling system. Purchase of equipment for standardising the armed forces has to be made. But there should be process. We find that in this purchase the parliament, the cabinet and the armed forces were not involved. We already have a policy for our military purchase. That is we purchase from China. China has supplied equipment from the very beginning at friendly prices and friendly negotiations. I remember when Ziaur Rahman went to China in 1980 as our president, he signed an overall umbrella agreement. That ensured military supply line from China. And he said defense will be the key link in our relationship. So it is a big departure to go for Russia all on a sudden. Second thing is that the operational army definitely has some policy. But politically formulated policy has not been worked so far. In the last parliament I was the chairman of the parliamentary defense committee. We had 4 or 5 meeting on this. And we tried hard. We made a committee for this purpose, a specialised committee with technocrats and military generals. They produced the paper. Ultimately we could not make it because time was short. Strategically, Russia and china are having a very good relationship now. China Russia and CIS countries have formed Shanghai Cooperation Organisation (SCO). Soon Iran and India will be full members of that. Bangladesh should think about SCO as our neighbouring countries are militarily very strong. Bangladesh should have defense capacity to protect resources on our land and in the sea. Secondly, strategic partnership with a big country will raise the image and negotiating capability of our country. The Indian Ocean has become an epicenter of power play. Russia will definitely want to enter here. It is still one of the largest countries with lots of explored and unexplored resources. We are still skeptical about nuclear power. Bangladesh has definitely the capacity to maintain it for peaceful purpose. This is a manifestation of our prosperity and modernisation. Since 1971, despite the ups and downs the relationship with Russia has been very strong. Now, our export is looking for new market. Not only Russia but also the whole Central Asia is very important for us to explore the possibilities. I do not agree that these defense installations must have to be manned by our own people. Ideally, it should be like that. However, until we make our people trained foreign specialists can do the job. Just like any other plants. Even in Pakistan when it was started, some of the brightest Bengali people went there to build the Atomic Energy Commission. We choose Russia over China because of the favorable financial deal and the more sophisticated technology. There are some misinformation I would like to clear from my experiences. According to the first deal that was signed by Sheikh Mujibur Rahman, The MIG 21s that Russians gave to Bangladesh were factory fresh and then latest version. We got the transport aircrafts, the radars, the MI 8 helicopters virtually with no payments. As no payment for the first ten years and the next ten years, the payment was in Bangladeshi Taka. Then our going to China was actually a step backward. The Chinese F6 was a copied version of Russian MIG 19, which was of 1952 design. Russia was not using those because of different engineering defects, as those were their first supersonic planes. We paid a heavy price with the risk of lives of our pilots. With Russia our air force have always a good working relationship. We have proved that it is possible to have working relationship with all. In the previous regime of Sheikh Hasina, we for the first time got the clearance from the State Department that Bangladesh can get offensive weapons from the USA. For the Chinese aircraft, the initial price may be very low. But cost of the spare parts are so high and lifetime is so short that over the year it ends up with high cost. The most important points are accountability and transparency that are applicable to all deals. I do not think $1 billion is a very big deal comparing with the military budget of Bangladesh. Two important sides are the diplomatic and the financial side. As from the diplomatic side, it is well accepted. The prime minister's visit is a renewing of our relationship with a major super power. There is no doubt that Bangladesh army needs arms and ammunition. It is good to diversify the sources as much as possible. The point of dispute is about the loan that we obtained and the rate of interest we have to pay. It is a lot of burden for our budget. We have to pay it in 15 installments that will begin in 2018. Another problem is that the arms deal is tied with the nuclear part. You have to take the two components. You cannot take only one. The financing would have been much better if we could have pay this from our own sources of funds. I see this deal as a technical maneuver, as a marriage of convenience between Dhaka and Moscow. I do not predict any strategic transformation in Bangladesh-Russia relations. There is nothing to be worried about whether we are getting out of the Chinese or US sphere of influence because we do not have that type of deep-seated transformation in political, military and intellectual thinking of our foreign policy. We only talk about the physical safety of our nuclear plant but there is also risk of attack from non-state actors like terrorists and Islamic extremists. Pakistan is really worried about this issue. It is a great opening for Bangladesh. Russia's technology is very superior in every respect and they have shown interest in various sectors. Bangladesh side has to understand what they are looking for. We need to go for a long-term relationship with Russia, and for that, we have to do proper home work. We can initiate joint assembling plant with Russia. We are getting third generation nuclear power plant for Rooppur. We have to be very careful about the protection of the plant both from natural disasters and terrorism. We are not very conversant with Russia's recent transformations. We have to carefully monitor her development. Our relations with Russia will depend greatly on how we conceive our relationship with our neighbours-India, China and the USA. We cannot just jump into a very deep relationship yet.